Keith Olbermann was put on earth to be appreciated by people like me. As a lifelong sports fan who is also engaged in culture and politics, I exist on Olbermann’s wavelength, preferring a smart, if occasionally smartass, take on the day’s news instead of the dumbed-down spoon-fed approach found pretty much everywhere else. 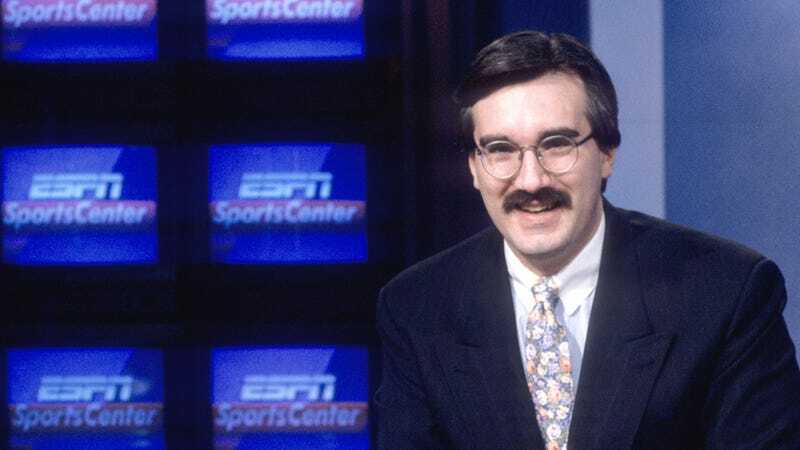 During his heyday in the 1990s, Olbermann (along with Dan Patrick) was the face of SportsCenter. Actually, not really the face—thank God he dropped that mustache—but the voice of the program and, by extension, of the network. It’s easy to forget, but at one point ESPN was endearing—not the colossus we know now. Olbermann had a lot to do with that. Coming to prominence at a time when David Letterman’s irony-fueled late-night show was comedy’s gold standard, Olbermann subverted the idea of the staid sportscaster whose only mission was to bring you the scores. Sports were no longer a thing out there while the rest of us were just over here quietly observing; Olbermann suggested we should interact with (and talk back to) the sports we loved. (He became known for running gags on SportsCenter, like when he’d show a good defensive play in baseball and say, “If you’re scoring at home…or even if you’re alone.”) Sports were entertainment, and their fans were intelligent enough to see through the old clichés. That’s not the ESPN to which Olbermann returned last week. Then again, he’s not the same Olbermann either. Olbermann, his weeknight show, is still finding itself, but at this point, it’s a sometimes tedious, occasionally terrific mixture of old-school SportsCenter and Olbermann’s former MSNBC program Countdown. There have already been plenty of memorable moments, but rather than being a fresh twist on Olbermann’s appeal, Olbermann feels like a greatest-hits album—or perhaps more accurately, one of those late-career CDs when an aging band rerecords all its old hits. Still fun, kind of familiar, but also sort of off: That’s what Olbermann (and, by extension, Olbermann) has been thus far. Sports on Earth’s Will Leitch suggests part of the problem is that Olbermann, an inveterate troublemaker, will have a tough time working for the Worldwide Leader: He’s better hurling grenades as an insurgent than cuddling up with the establishment. But for me, watching Olbermann is to be reminded that, essentially, this is just another version of what cable sports have become in the past 20 years. Olbermann is a smarter, funnier variation, but its sarcastic, impassioned host, once a trailblazer, is now lagging behind a model he helped create. Sadly, however, the model didn’t get better after he left SportsCenter in 1997. His descendants learned all the wrong lessons from him. And in the process, they became inexplicably successful—and, worse yet, ubiquitous. There were sports-media personalities before Olbermann. Howard Cosell was such a popular, polarizing figure that he became an institution. (And never forget that Jimmy the Greek was actually a thing.) But Olbermann brought an above-it-all air that was new. Unlike his predecessors, he looked like he was supposed to be on television but acted as if he had mixed feelings about this whole broadcasting thing. (This, of course, was disingenuous: His smart-alecky persona had already been well-honed as an L.A. sports anchor in the 1980s; the YouTube proof is here.) When he and Patrick became SportsCenter hosts, they told jokes and amused themselves—the implication being that if you were hip enough, you’d laugh too. This was part of ESPN’s branding strategy. Inspired by Olbermann’s standard send-off to commercial break, the network started doing its “This Is SportsCenter” ad campaign, which cast athletes opposite ESPN personalities, often in faux-realistic, deadpan comedic bits. (A personal favorite is the one in which Olbermann operates on then QB Jim Harbaugh.) Beyond just being funny, the spots wanted you to understand there wasn’t much difference between our sports heroes and the rest of us—oh, and that the ESPN crew hung out with these guys all the time. Being knowledgeable about the sports they covered was important, but for the love of God, ESPN’s on-air talents needed to make sure they entertained first and foremost. Olbermann’s successors took it from there—unfortunately. Descendants such as Rich Eisen and Stuart Scott turned SportsCenter into an open-mike-night atmosphere, and by the early 2000s, shows like Pardon the Interruption started popping up. These programs consisted of different columnists pummeling us with their hair-trigger takes on the latest sports gossip and minutiae. (Remember in the 1980s, when it was just the relatively courtly Sports Reporters?) Flip on ESPN’s phalanx of channels now and you’ll find Mike and Mike in the Morning, Around the Horn, First Take, SportsNation or Highly Questionable. It’s unfair to lay these complaints solely at the feet of Olbermann. It’s not like he suggested that ABC hire the too-cool-for-the-room Dennis Miller to co-host Monday Night Football. And ESPN had much worse “personalities,” such as Chris Berman, who pre-dated Olbermann. Olbermann simply played the game better than those around him, who couldn’t replicate “smart” and instead settled for “colorful”—which mostly translated into persistently loud or dumb. But Olbermann also pissed off everyone around him along the way. For all of Olbermann’s verbal dexterity and showmanship, his legacy is as much about his on-air talent as it is his arrogance and his contentious departure from high-profile jobs. He abruptly exited ESPN in 1997, his former colleagues’ anger so strong that when the ESPN oral history Those Guys Have All the Fun came out in 2011, they all reveled in taking shots at him. He jumped to MSNBC briefly to try his hand at a politics show and then landed at Fox Sports Network, where he was fired. (Rupert Murdoch’s infamous explanation for Olbermann’s termination: “He’s crazy.”) Olbermann returned to MSNBC and successfully made the switch to politics with Countdown—reinventing himself in the process—but in 2011 he brusquely departed for a second time. Again, the fallout was spectacular. A year later, he was booted from his gig at the low-rated Current, and it’s possible more people paid attention to the resulting bitching-in-the-media fireworks between Olbermann and his former bosses than actually watched his Current show. The one clear-cut success of Olbermann’s first days has been his monologues. Mixing history, passion and current events, Olbermann deftly used the 50th anniversary of Martin Luther King Jr.’s “I Have a Dream” speech to speak movingly about his deceased father’s memories of racism. And he’s already gotten plenty of mileage out of the NFL’s pitiful settlement agreement for concussion victims, remembering the life of running back Doug Kotar, whose death from a brain tumor was probably the result of his football career, and laying waste to a CBS Sports football writer who mocked players’ concerns about permanent brain injuries. This is what he did superbly on Countdown as well, summoning that eloquent, growing anger—permanently intertwined with his self-important stridency, alas—to cut through the noise. The show’s internal tension simply underlines the fact that Olbermann’s old routine on SportsCenter was merely the starting point for his ambitions: He had his eye on far loftier goals. As funny as he can be doing highlights on Olbermann, there’s a sense that, really, he should be doing something better than that by now. The irony is that just about nobody on any sports network could hope to achieve what he’s done already on Olbermann; they’d be lucky to make you laugh as much, and his monologues’ slow-boiling rage are too nuanced for people who think silence is a sign of weakness. Watching Olbermann every night last week, I felt I had discovered a real-life version of The Newsroom, with Olbermann taking Will McAvoy’s “mission to civilize” seriously. Like the fictional McAvoy, Olbermann accepts it as a given that he’s the smartest, most interesting person around. And like McAvoy, he may be right—but he’s also deluded to think he can alter the fundamental realities of an industry. For as much as ESPN is trying to change its image by creating the erudite sports-and-culture website Grantland and hiring brilliant sports-and-politics statistician Nate Silver, its reputation remains that of a bunch of ex-jocks har-harring, backslapping and mouthing locker-room clichés, safe in the knowledge that they’ve got the monopoly on sports coverage. Olbermann’s reappearance on the network is no doubt part of the brand’s attempt to reimagine itself, but the place isn’t the same as the one he left more than 15 years ago. It’s a lot worse. The media have described Olbermann’s return to ESPN as a comeback, a redemption story and the heartwarming conclusion of a prodigal-son return. I see it more as a strange fit. Olbermann has long prided himself on being the smartest guy in the room—I just don’t like the room he’s in.